Howie's vest game is strong. 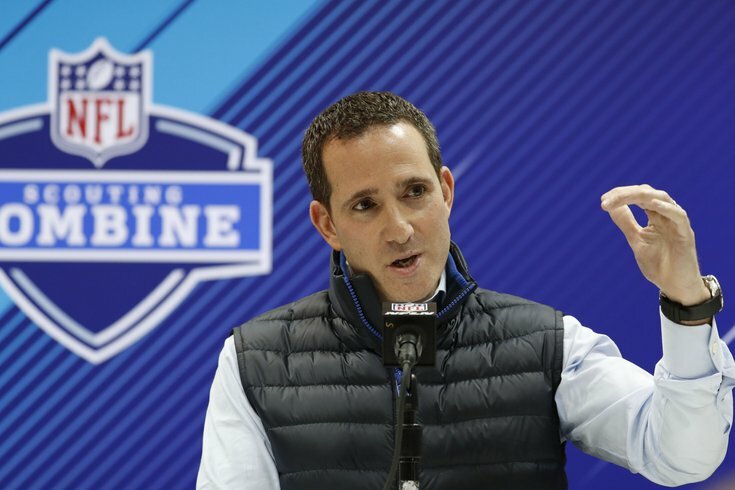 The first (official) day of free agency is in the books, and the Philadelphia Eagles weren't as busy as they are in other years, but they didn't exactly sit on the sidelines either. In total, they signed one player from the outside, traded for two others, and re-upped one of their own. Because I'm a hack sellout, let's assign the Eagles an arbitrary letter grade for each move! In 2017, Bennett had 25 tackles and 8.5 sacks. Over the last six years, he has 48 sacks and 10 forced fumbles. Bennett can still play, but he's 32 years of age, and will turn 33 in November. Assuming Vinny Curry is the odd man out, the Eagles' defensive ends are now Brandon Graham, Michael Bennett, Derek Barnett, and Chris Long. Graham and Bennett are both also versatile players who can kick inside to defensive tackle on obvious passing downs, as Graham did when he forced a fumble of Tom Brady in the Super Bowl. The Eagles have an extremely deep group of defensive ends, and have now also added some versatility to that unit. Their already very good pass rush got even more dangerous with the addition of Bennett. Last offseason, the Eagles traded a 7 and Matt Tobin to Seattle for a 5. Seattle than traded that same 7 and Michael Bennett for that same 5 and Marcus Johnson. In other words, the Eagles basically traded Matt Tobin and Marcus Johnson for Michael Bennett, lol. That is some wizardry from Howie Roseman. Smith is a good person and locker room presence, however, the Eagles made the extraordinarily easy decision to save $5 million by parting ways with him. In my view, Smith did not play well enough in 2017 to justify that price tag. He led the team in drops by a considerable margin, and often went long stretches without making plays in the offense. His release (or rather, the Eagles' decison not to pick up a team option on him) was inevitable. It's crazy that another team would give anything up for him, much less take him on at his current contract. In Worley, the Eagles acquire a 23-year-old cornerback with 25 starts under his belt. There are some character concerns with Worley, but the Eagles have had great recent success adding those types of players. If we're being completely honest, I didn't know Nelson existed before the Eagles made this trade, but after having watched a little bit of him, I can see why they like him. Like Mychal Kendricks, the player he is likely to replace, Nelson is an undersized linebacker with good speed. If the Eagles are able to find a trade partner for Kendricks, they will save $4.4 million. Nelson's one-year deal will cost $2.25 million, so there will be a savings of over $2 million, but certainly there's risk that Nelson will not be as good as Kendricks. When Jordan Hicks was lost for the season with a ruptured Achilles in 2017, Bradham instantaneously became the most solid and trustworthy linebacker on the roster. He took over Hicks' role of relaying the play calls from Jim Schwartz to the rest of the defense, an experience that undoubtedly gave Bradham a deeper understanding of the scheme as a whole. Bradham is a three-down linebacker who never comes off the field, staying in when the Eagles use sub-packages, because of his ability in coverage. Clearly, Bradham was a priority to the Eagles, but he comes at the high cost of $8 million per year, when there was perhaps hope that the linebacker market wouldn't be quite that high. Still, retaining Bradham means that the Eagles will have 21 of 22 starters returning to try to repeat as Super Bowl champions in 2018. This was a difficult decision for the team to make, seeing as Celek has been with the team for 11 years, and missed a grand total of one game, which he only sat out because it was a Thursday game for which he was unable to clear the concussion protocol in time. Still, Celek's release created $4 million under the cap on a team that needed all the room they could get. It was time. We won't give a grade here, because the Eagles didn't actually do anything, though I will note that they made the correct decision not to try to match the deals that any of the three players above received on the open market.